There is a large population of Polish people who have been living in Chicago (and the surrounding suburbs) for many generations. Having a thriving community here in Chicago, you’ll find several Polish grocery stores and delicatessens available. But only if you look for them. 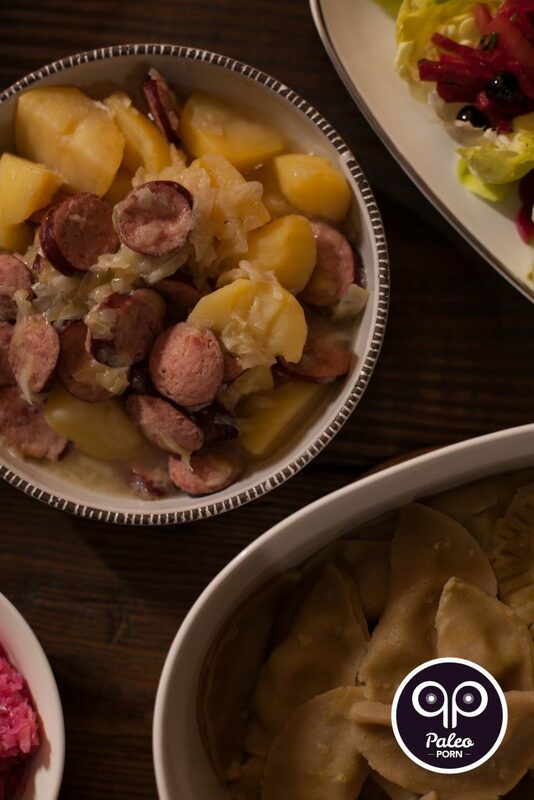 When I decided on a traditional Polish theme for Christmas and added this Polish Sausage and Cabbage Stew to the menu, I set out to find a local Polish deli to source the ingredients. 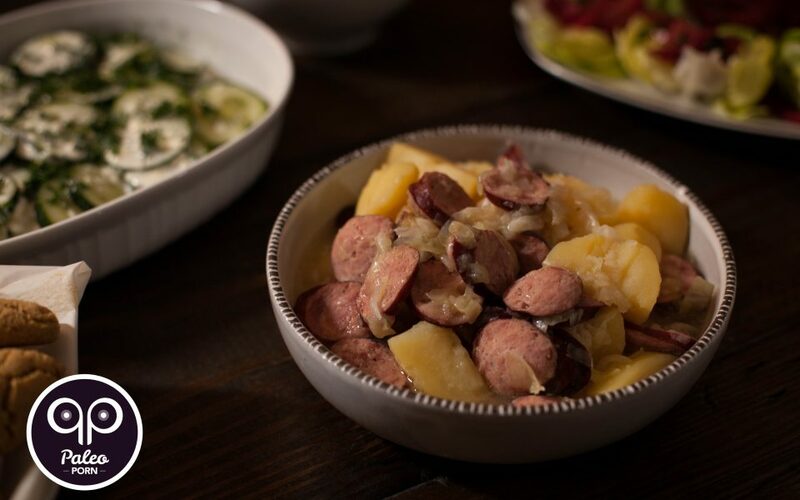 This unassuming, traditional Polish stew filled with sausage, potatoes and cabbage may appear to be an unexciting dish but let me just say, you sir or madam would be dead wrong with that assumption. Since making this on Christmas, we enjoyed it so much, I had to make it again soon after! If you live in Chicago, kiełbasa is a word that’s part of your vocabulary. In Polish it means sausage but in Chicago it is used interchangeably for sausage. When I was talking to my friend Rafał after making kiełbasa one night for dinner, he was surprised that I didn’t say sausage. It was a fun conversation because I never thought twice about using that word. There are so many different kinds of sausage. 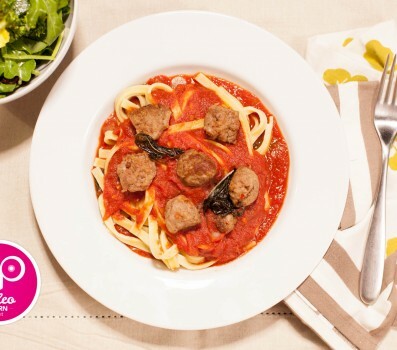 For example, Italian sausage is a pork sausage that gets its flavor from the addition of anise and/or fennel seed. You’ll typically find it available in mild (sweet) and spicy options in most American grocery stores. However, if you look for Italian sausage in Italy you’ll find so many more options than what are available here in the US. Mexican sausage, also known as Chorizo, is another pork sausage made using native chiles instead of smoked paprika (which is the preferred option for European, Spanish-made chorizo). Again, there are many differences in ingredients used to season and flavor the sausage. You’ll notice a difference in color, some are green thanks to the addition of tomatillos, and flavor based on what is added. 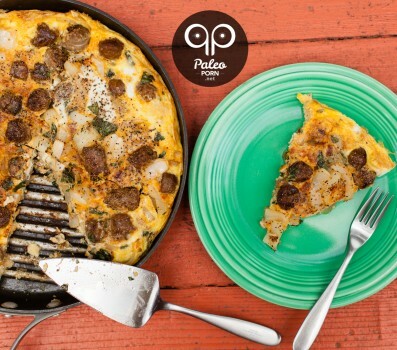 You’ll find a recipe for Mexican Chorizo in our next cookbook, Paleo MX. 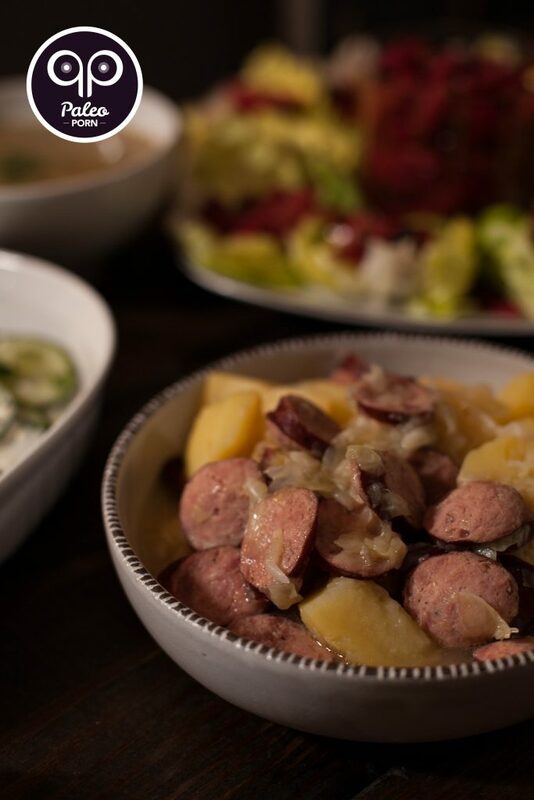 When I decided to add kiełbasa to our menu I wanted to find a Polish deli to source the meat from. Just like Italian and Mexican sausage, Polish sausage (kiełbasa) also comes in several different varieties. Your first option is smoked or fresh. Just as you’ll find with other types of sausage, Polish sausage can be made using pork, beef, lamb or several other types of protein. I was looking for a local Polish grocery store where I could find traditionally made kiełbasa and that’s when I found Gene’s Sausage and Delicatessen. Gene’s makes over 40 different varieties of smoked sausages and meats. All sausage are made the old-fashioned way. Stuffed and hand-tied by old world sausage makers and smoked in cherrywood and mesquite. They use their own tried and true formula of ingredients from freshly butchered all natural hormone free pork and grass-fed beef with natural casings, no preservatives or added nitrates or nitrites. In December of 2015 when I was shopping at Gene’s I actually went to their second location, not on Lincoln Ave but on Belmont, and came home with a couple different sausages. The Alpine Sausage has double garlic and is double smoked and I could not pass it up. I also picked up some traditional kiełbasa for this recipe. Two months later, now that I’m writing about my experience, I went to look up the address again and felt like I was going crazy because the Belmont location was no where to be found! They actually closed the second location due to the owners retiring. However, if you’re in Chicago you should definitely check out Gene’s Sausage Shop and Delicatessen which is located at 4750 N. Lincoln Ave.
Don’t worry! If you’re not in Chicago and don’t have access to Gene’s, you can still make this dish! You’ll find Polish sausage available at any grocery store in the cased meat section, though I’d definitely recommend you find a local butcher or deli near where you live. If you’re not sourcing from a butcher where you can ask what ingredients are added, be sure to read the packaging for any ingredients you cannot pronounce. Majority of sausage is gluten-free but just be sure and read the package. 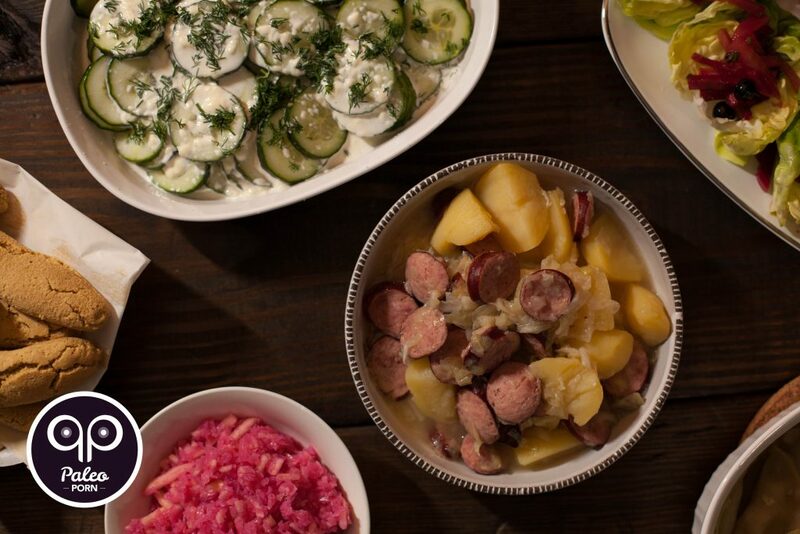 You can also find pasture-raised pork and grass-fed beef and lamb Polish sausages online. We’ve tried both U.S. Wellness Meats pork and beef Polish sausage and Lava Lake Lamb‘s lamb Polish sausage. Salt is a staple when cooking. It’s always there, whether you realize it or not. Salt helps bring out the flavor of most anything from watermelon to meat. If you think something is missing in a dish, my first recommendation would be to add a pinch or two of salt. However, you may be surprised to realize that salt is not an ingredient in this dish. 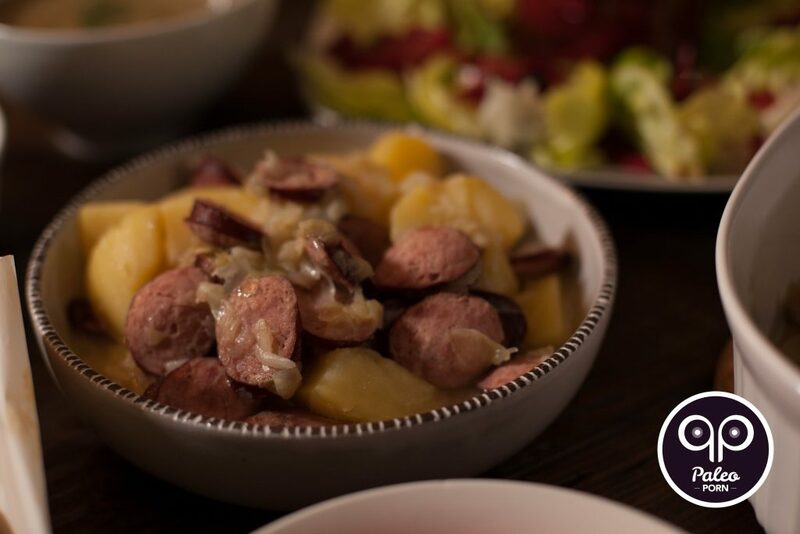 The kiełbasa adds all the flavor it needs and as the ingredients sit and stew together, all that flavor from the sausage is transferred to the cabbage, potatoes and broth. And for that reason additional salt just isn’t necessary. You may want to sprinkle extra salt on the dish as you’re serving, but be sure and taste it first because it truly may not be necessary. Slice the Polish sausage into 1-inch pieces. Add the sausage and sliced onion to a large stock pot (I used my 10 quart pressure cooker) over medium heat. Stir periodically but cook until the onions start to slightly brown. Add the cabbage, stir to combine and cover the pot. Continue to cook everything until the cabbage becomes limp. Add the potatoes and 2 cups of chicken broth. 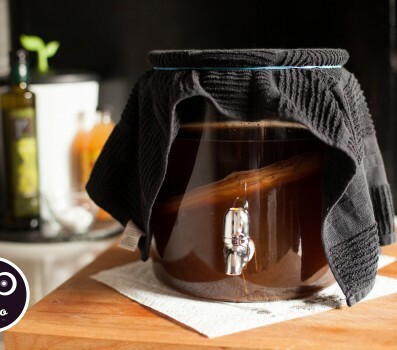 Bring to a boil, cover and simmer until the potatoes are tender. Add the remaining chicken broth and lemon juice to the pot. Bring to a boil and cook uncovered until the sauce thickens. 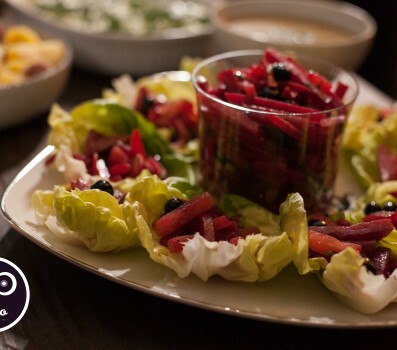 Serve warm, seasoned with sea salt and caraway seeds, to taste.